16" x 6.5"J Alloy Wheels, AM/FM/XM Ready/CD Audio System, Outside temperature display, Power moonroof, Remote keyless entry, Security system, Speed control, Steering wheel mounted audio controls, Telescoping steering wheel, Tilt steering wheel. Clean CARFAX. 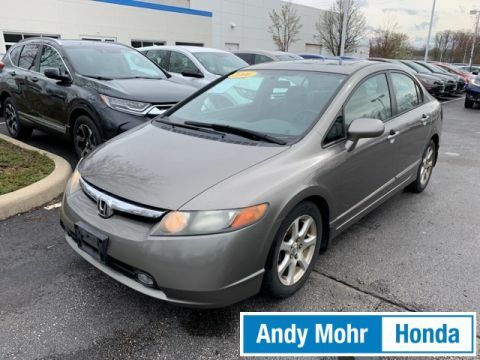 30/40 City/Highway MPG Awards: * NACTOY 2006 North American Car of the Year Galaxy Gray Metallic 2006 Honda Civic EX FWD Get MOHR for your money at the ALL NEW Andy Mohr Honda/Hyundai in Bloomington! Call us today at 812-336-6865. 160-Watt AM/FM/CD Audio System, Alloy wheels, Remote keyless entry, Security system, Speed control, Spoiler, Telescoping steering wheel, Tilt steering wheel. Clean CARFAX. 25/36 City/Highway MPG Awards: * JD Power Initial Quality Study * 2011 IIHS Top Safety Pick * 2011 KBB.com Brand Image Awards 2016 Kelley Blue Book Brand Image Awards are based on the Brand Watch(tm) study from Kelley Blue Book Market Intelligence. Award calculated among non-luxury shoppers. For more information, visit www.kbb.com. Kelley Blue Book is a registered trademark of Kelley Blue Book Co., Inc. Reviews: * If you appreciate world-class refinement (along with impressive mileage), and you're looking to spend anywhere from $16,000 to $25,000 for a new car, your test-drive schedule might not continue past the Honda dealer. Source: KBB.com Crystal Black Pearl 2011 Honda Civic LX-S FWD Get MOHR for your money at the ALL NEW Andy Mohr Honda/Hyundai in Bloomington! Call us today at 812-336-6865. AM/FM/CD Audio System, Remote keyless entry, Security system, Telescoping steering wheel, Tilt steering wheel. CARFAX One-Owner. Clean CARFAX. 25/36 City/Highway MPG Awards: * 2008 KBB.com Brand Image Awards 2016 Kelley Blue Book Brand Image Awards are based on the Brand Watch(tm) study from Kelley Blue Book Market Intelligence. Award calculated among non-luxury shoppers. For more information, visit www.kbb.com. Kelley Blue Book is a registered trademark of Kelley Blue Book Co., Inc. Reviews: * If you appreciate world-class refinement (along with impressive mileage), and you're looking to spend anywhere from $15,000 to $23,000 for a new car, your test-drive schedule might not continue past the Honda dealer. 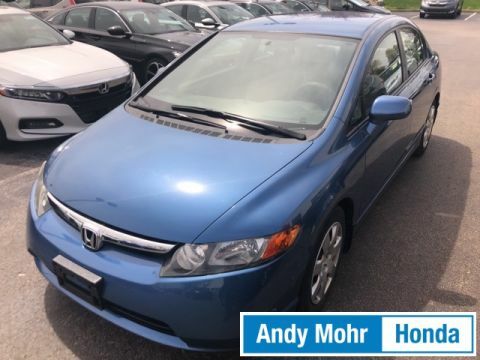 Source: KBB.com Atomic Blue Metallic 2008 Honda Civic LX FWD Get MOHR for your money at the ALL NEW Andy Mohr Honda/Hyundai in Bloomington! Call us today at 812-336-6865. 15" Alloy Wheels, 6 Speakers, Automatic temperature control, Electronic Stability Control, Fabric/Leatherette Seat Trim, Fully automatic headlights, Heated door mirrors, Honda Satellite-Linked Navigation System, Outside temperature display, Rearview Camera w/Guidelines, Steering wheel mounted audio controls, Telescoping steering wheel, Tilt steering wheel, Traction control, Turn signal indicator mirrors. Clean CARFAX. 41/44 City/Highway MPG Awards: * 2012 IIHS Top Safety Pick * 2012 KBB.com Total Cost of Ownership Awards * 2012 KBB.com Brand Image Awards 2016 Kelley Blue Book Brand Image Awards are based on the Brand Watch(tm) study from Kelley Blue Book Market Intelligence. Award calculated among non-luxury shoppers. For more information, visit www.kbb.com. Kelley Blue Book is a registered trademark of Kelley Blue Book Co., Inc. Reviews: * Thrifty fuel economy; low price for a hybrid. Source: Edmunds * While its fuel-economy figures are not as impressive as the Toyota Prius, the 2012 Honda Insight hybrid nevertheless is a gas mileage champ. And, unlike some hybrid cars, the Honda Insight is priced competitively enough as to be able to justify the added hybrid cost relative to future gasoline savings. 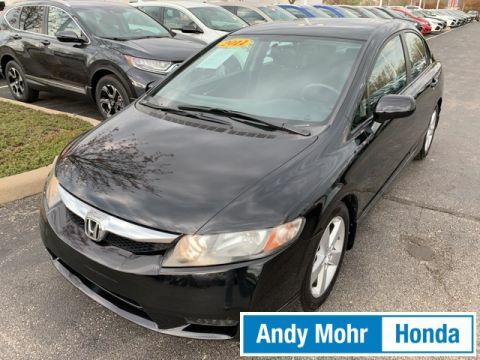 Source: KBB.com Crystal Black Pearl 2012 Honda Insight EX FWD Get MOHR for your money at the ALL NEW Andy Mohr Honda/Hyundai in Bloomington! Call us today at 812-336-6865. 160-Watt AM/FM/CD Audio System, Electronic Stability Control, Outside temperature display, Power door mirrors, Speed control, Telescoping steering wheel, Tilt steering wheel. CARFAX One-Owner. 30/39 City/Highway MPG Awards: * 2014 IIHS Top Safety Pick+ * 2014 KBB.com Brand Image Awards 2016 Kelley Blue Book Brand Image Awards are based on the Brand Watch(tm) study from Kelley Blue Book Market Intelligence. Award calculated among non-luxury shoppers. For more information, visit www.kbb.com. Kelley Blue Book is a registered trademark of Kelley Blue Book Co., Inc. Reviews: * With its reputation for reliability, safety, comfort and excellent resale still intact, the 2014 Honda Civic remains one of the best small-car values around. Be it the standard sedan, sporty coupe, racy Si trim, frugal hybrid or ultra-clean CNG model, there is a Civic to meet almost any demand. Source: KBB.com * Redesigned for 2014 the Honda Civic is back to rest the critics of the past. Whichever Civic you choose, you'll find the technology and refinement to make the journey more exciting than the destination. A new front grille and headlights adorn the front end, while new taillights help you stand out from behind. Add to that its wheel options and you've got the sleekest Civic yet. The 1.8L, single overhead camshaft, aluminum-alloy i-VTEC 4-cylinder engine uses state of the art engineering technology to produce an impressive 143hp, yet it still receives excellent fuel-efficiency ratings and a Partial Zero-Emission Vehicle rating, all on regular gasoline. Honda's new Earth Dreams continuously variable transmission (CVT) provides an outstanding driving experience. The CVT allows the engine to always operate at the most efficient rpm level, enabling maximum efficiency under all driving conditions. Interior features include an impressive array of available tech features including an available 7-inch display audio with a touch-screen interface; the Honda LaneWatch system which activates a tiny camera on the passenger side mirror when you signal to change lanes to cover more view than the passenger-side mirror; HondaLink's Aha app allows you to access news, social media, restaurant searches, internet radio, and more; a rearview camera is available with up to 3 available angles to view; Satellite navigation is also available with voice recognition software. The Civic's Advanced Compatibility Engineering II body structure is a Honda-exclusive body design that enhances occupant protection and crash compatibility in frontal collisions. The ACE design utilizes a network of connected structural elements to distribute crash energy more evenly throughout the front of the vehicle. This enhanced frontal crash-energy management helps to reduce the forces transferred to the passenger compartment and can help to more evenly disperse the forces transferred to other vehicles in a crash. 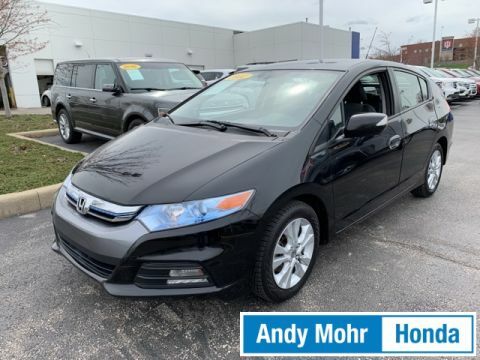 Source: The Manufacturer Summary Crystal Black Pearl 2014 Honda Civic LX FWD Get MOHR for your money at the ALL NEW Andy Mohr Honda/Hyundai in Bloomington! Call us today at 812-336-6865. 160-Watt AM/FM/CD Audio System, Anti-whiplash front head restraints, Brake assist, Electronic Stability Control, Overhead airbag, Remote keyless entry, Security system, Speed control, Telescoping steering wheel, Tilt steering wheel. CARFAX One-Owner. Clean CARFAX. Odometer is 30680 miles below market average! 28/35 City/Highway MPG Awards: * JD Power Dependability Study * Car and Driver 10 Best Cars * ALG Best Residual Value * 2013 IIHS Top Safety Pick * 2013 KBB.com Best Resale Value Awards * 2013 KBB.com 10 Coolest New Cars Under $18,000 * 2013 KBB.com Brand Image Awards 2016 Kelley Blue Book Brand Image Awards are based on the Brand Watch(tm) study from Kelley Blue Book Market Intelligence. Award calculated among non-luxury shoppers. For more information, visit www.kbb.com. Kelley Blue Book is a registered trademark of Kelley Blue Book Co., Inc. Car and Driver, January 2017. Reviews: * If finding a small car that can comfortably fit four adults for around $16,000 seems like a pipe dream, its time to wake up. The Honda Fit not only qualifies, it also gets around 35 mpg on the highway and holds its value better than just about anything in its class. Source: KBB.com * Unmatched cargo room and cabin versatility; spacious backseat; fun to drive; excellent visibility; simple controls. 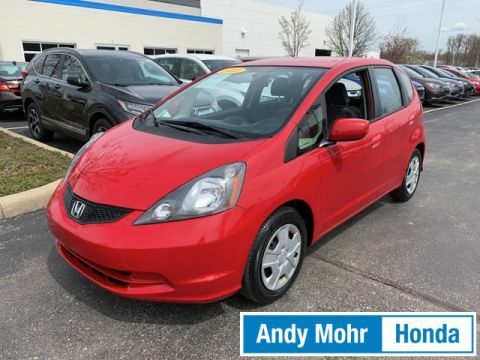 Source: Edmunds Milano Red 2013 Honda Fit FWD Get MOHR for your money at the ALL NEW Andy Mohr Honda/Hyundai in Bloomington! Call us today at 812-336-6865. 16" Alloy Wheels, 160-Watt AM/FM/CD Audio System, Electronic Stability Control, Exterior Parking Camera Rear, Fully automatic headlights, Outside temperature display, Power moonroof, Remote keyless entry, Speed control, Spoiler, Steering wheel mounted audio controls, Telescoping steering wheel, Tilt steering wheel. CARFAX One-Owner. Clean CARFAX. 29/37 City/Highway MPG Awards: * ALG Residual Value Awards * 2015 IIHS Top Safety Pick * 2015 KBB.com 10 Tech-Savviest Cars Under $20,000 * 2015 KBB.com Our 10 Favorite New-for-2015 Cars * 2015 KBB.com Best Resale Value Awards * 2015 KBB.com 10 Most Affordable Cars * 2015 KBB.com Brand Image Awards 2016 Kelley Blue Book Brand Image Awards are based on the Brand Watch(tm) study from Kelley Blue Book Market Intelligence. Award calculated among non-luxury shoppers. For more information, visit www.kbb.com. Kelley Blue Book is a registered trademark of Kelley Blue Book Co., Inc. Reviews: * The 2015 Fit is affordable, easy to drive and can haul as much as a compact SUV. Perfect for off-to-college youngsters or empty nesters looking to downsize without sacrificing rear-seat legroom, the Honda hatchback offers new safety and connectivity features you'd expect in class-above vehicles like the Dodge Dart and Mazda3. Source: KBB.com * Unmatched small car versatility thanks to unique rear seat design; quick acceleration; high fuel economy; spacious seating and cargo area; excellent visibility. Source: Edmunds * Redesigned for 2015 welcome the new Honda Fit. With a slick new body design and a wider stance you'll notice the unique styling and accents are everywhere you look. The interior has been loaded with features not usually seen in a car of its class including available leather-trimmed interior with heated front seats and 60/40 split rear seats. Tech features include the available Honda LaneWatch which activates a tiny camera in the passenger side mirror to display a live feed to the center 7 touch screen. With HondaLink Next Generation you can be connected to the world and access many of your favorite iPhone apps via the audio interface. With the Honda Satellite-Linked Navigation system you can navigate to all of your favorite destinations and with the HD Digital Traffic feature you can avoid gridlock and slowdowns. The 130hp engine @ 6600rpm gives the Fit plenty of zip and with a choice of a 6-speed manual transmission or the continuously variable transmission you will be sure to maximize efficiency whatever the driving conditions. With the ECON button your Fit will be able to automatically adjust fuel-consuming systems to maximize efficiency and with Eco Assist the coaching bars will be able to help you show how efficiently you are driving so that you can maximize your gas tank. With up to 41mpg available in the CVT models you should not have a problem. Safety features include the next-generation Advanced Compatibility Engineering body structure which is a Honda exclusive design that utilizes a network of connected structural elements to distribute frontal crash energy more evenly throughout the front of the vehicle. A multi-angle rearview camera comes standard on every fit this generation and shows much more of what's behind from 3 different angles. 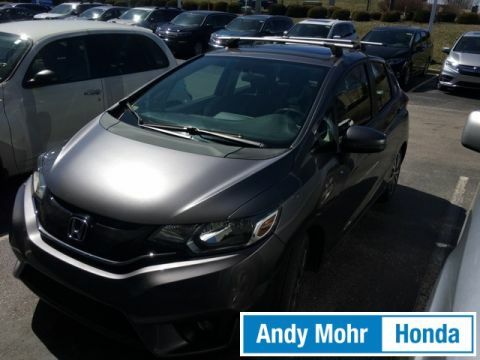 Source: The Manufacturer Summary Modern Steel Metallic 2015 Honda Fit EX FWD Get MOHR for your money at the ALL NEW Andy Mohr Honda/Hyundai in Bloomington! Call us today at 812-336-6865. Priced below KBB Fair Purchase Price! Certified. 16" Alloy Wheels, 160-Watt AM/FM/CD Audio System, Automatic temperature control, Electronic Stability Control, Front dual zone A/C, Fully automatic headlights, Outside temperature display, Power door mirrors, Remote keyless entry, Speed control, Steering wheel mounted audio controls, Telescoping steering wheel, Tilt steering wheel, Traction control. Clean CARFAX. 27/36 City/Highway MPG Honda Certified Pre-Owned Details: * Roadside Assistance with Honda Care purchase * Limited Warranty: 12 Month/12,000 Mile (whichever comes first) after new car warranty expires or from certified purchase date * Vehicle History * Transferable Warranty * Powertrain Limited Warranty: 84 Month/100,000 Mile (whichever comes first) from original in-service date * 182 Point Inspection * Warranty Deductible: $0 Awards: * 2014 IIHS Top Safety Pick+ * ALG Residual Value Awards * Green Car Journal 2014 Green Car of the Year * 2014 KBB.com Brand Image Awards 2016 Kelley Blue Book Brand Image Awards are based on the Brand Watch(tm) study from Kelley Blue Book Market Intelligence. Award calculated among non-luxury shoppers. For more information, visit www.kbb.com. Kelley Blue Book is a registered trademark of Kelley Blue Book Co., Inc. Based on 2017 EPA mileage ratings. Use for comparison purposes only. Your mileage will vary depending on how you drive and maintain your vehicle, driving conditions and other factors. Reviews: * Beyond its history of reliability and high resale value, the Accord is now more varied than ever. Whether you want a no-fuss and highly economical sedan, a sporty V6-powered coupe or a hybrid that attains 50 mpg in the city, the 2014 Accord offers something for everyone. Source: KBB.com * The Accord is synonymous with Honda and has been known for nearly four decades as a reliable, comfortable, pragmatic way to move families. What began as a 2-door hatchback in 1976 has grown into today's full-size sedan and coupe. Like the rest of the car, the 2014 Accord's 5-passenger interior is a pleasing step forward. The cabin boasts soft-touch materials for a quality feel. The front seats are comfortable, and the driver's seat actually toned down the lumbar support. The rear seats have even more room, as does the trunk. Sleek, rippled sheet metal defines a more streamlined exterior that has shrunk around an interior that feels roomier than previous generations. The most surprising thing about the Accord is its refined continuously variable transmission (CVT). Mated to the 4-cylinder, this CVT feels much like a normal automatic, mimicking gear changes. Even a base Accord has good power for acceleration and passing, yet attains an impressive mileage on the highway. Move up to a V6 model with 6-speed automatic transmission, and the Accord is downright quick. For the individual looking to consume less the 2014 Accord comes in a Hybrid version as well. This operates on a 141-hp 2.0-liter, 16-valve i-VTEC 4-cylinder engine and a 55-hp lithium-ion battery pack for a net hp of 196. The Hybrid can achieve ratings of 50 cty and 46 hwy. To help maximize efficiency on the road, the Accord Hybrid seamlessly shifts between three distinct drive modes: EV Drive, Hybrid Drive and Engine Drive. EV Drive is 100% electric, and generally is used during braking and when starting from a stop. Hybrid Drive uses the fuel engine and electric motor to provide extra zip during acceleration, and once your Accord Hybrid is cruising with highway efficiency, Engine Drive takes over. If you want a hassle-free, pleasing family car with a reputation for quality and an immediate familiarity, you can't go wrong with the Accord. 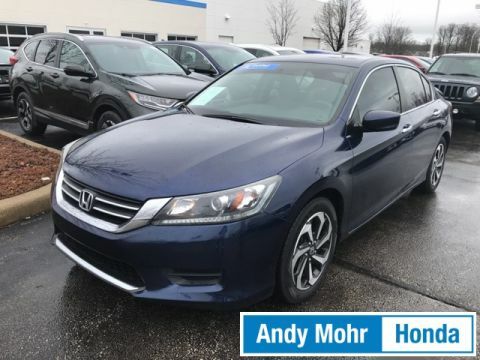 Source: The Manufacturer Summary Obsidian Blue Pearl 2014 Honda Accord LX FWD Get MOHR for your money at the ALL NEW Andy Mohr Honda/Hyundai in Bloomington! Call us today at 812-336-6865. 160-Watt AM/FM/CD Audio System, Electronic Stability Control, Outside temperature display, Power door mirrors, Remote keyless entry, Speed control, Steering wheel mounted audio controls, Telescoping steering wheel, Tilt steering wheel, Traction control. Clean CARFAX. Odometer is 27723 miles below market average! 28/39 City/Highway MPG Awards: * JD Power Initial Quality Study * 2013 IIHS Top Safety Pick * 2013 KBB.com Brand Image Awards 2016 Kelley Blue Book Brand Image Awards are based on the Brand Watch(tm) study from Kelley Blue Book Market Intelligence. Award calculated among non-luxury shoppers. For more information, visit www.kbb.com. Kelley Blue Book is a registered trademark of Kelley Blue Book Co., Inc. Reviews: * A unique combination of reliability, affordability and stellar resale value make the 2013 Honda Civic one of the best values in the automotive marketplace. The 2013 Civic is also the clear leader in terms of variety, with an expansive lineup comprised of sedan and coupe body styles, a high-performance Si variant, a 45-mpg hybrid model and an industry-exclusive natural-gas-powered version (limited availability). 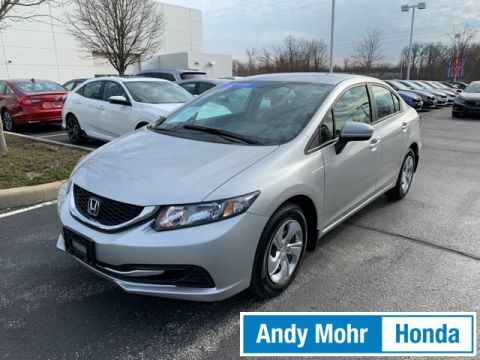 Source: KBB.com Alabaster Silver Metallic 2013 Honda Civic LX FWD Get MOHR for your money at the ALL NEW Andy Mohr Honda/Hyundai in Bloomington! Call us today at 812-336-6865. 17" x 6.5" Alloy Wheels, AM/FM/CD Audio System w/6 Speakers, Electronic Stability Control, Front fog lights, Outside temperature display, Power moonroof, Remote keyless entry, Security system, Speed control, Steering wheel mounted audio controls, Telescoping steering wheel, Tilt steering wheel, Traction control. Clean CARFAX. 22/30 City/Highway MPG Awards: * JD Power Initial Quality Study * 2012 IIHS Top Safety Pick (With Touring Model) * 2012 KBB.com Brand Image Awards 2016 Kelley Blue Book Brand Image Awards are based on the Brand Watch(tm) study from Kelley Blue Book Market Intelligence. Award calculated among non-luxury shoppers. For more information, visit www.kbb.com. Kelley Blue Book is a registered trademark of Kelley Blue Book Co., Inc. Reviews: * While a bounty of changes inside and out endow the 2012 Honda CR-V with a new level of user-friendly appeal, this latest incarnation retains its signature car-like driving feel and superb flexibility while delivering even better fuel economy. Source: KBB.com * Lots of room for passengers and cargo; high fuel economy; user-friendly controls; ample tech and family-friendly features; nimble handling. 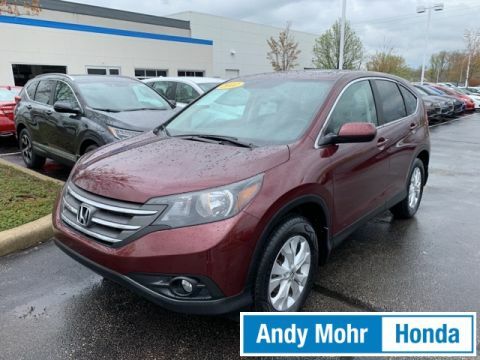 Source: Edmunds Basque Red Pearl II 2012 Honda CR-V EX AWD Get MOHR for your money at the ALL NEW Andy Mohr Honda/Hyundai in Bloomington! Call us today at 812-336-6865. 16" Alloy Wheels, 160-Watt AM/FM/CD Audio System, 6 Speakers, Electronic Stability Control, Exterior Parking Camera Rear, Fully automatic headlights, Outside temperature display, Power moonroof, Remote keyless entry, Speed control, Steering wheel mounted audio controls, Telescoping steering wheel, Traction control. CARFAX One-Owner. Clean CARFAX. Odometer is 14931 miles below market average! 32/38 City/Highway MPG Awards: * 2015 KBB.com Best Resale Value Awards * 2015 KBB.com 10 Tech-Savviest Cars Under $20,000 * 2015 KBB.com 10 Most Affordable Cars * 2015 KBB.com Our 10 Favorite New-for-2015 Cars * 2015 KBB.com Brand Image Awards 2016 Kelley Blue Book Brand Image Awards are based on the Brand Watch(tm) study from Kelley Blue Book Market Intelligence. Award calculated among non-luxury shoppers. For more information, visit www.kbb.com. Kelley Blue Book is a registered trademark of Kelley Blue Book Co., Inc. 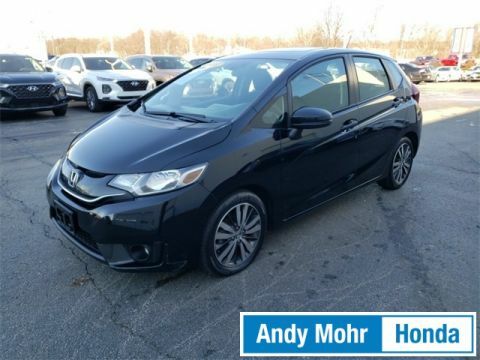 Crystal Black Pearl 2015 Honda Fit EX FWD Get MOHR for your money at the ALL NEW Andy Mohr Honda/Hyundai in Bloomington! Call us today at 812-336-6865. Certified. AM/FM/CD Audio System, Electronic Stability Control, Exterior Parking Camera Rear, Fully automatic headlights, Remote keyless entry, Speed control, Steering wheel mounted audio controls, Telescoping steering wheel, Tilt steering wheel, Traction control. Clean CARFAX. 33/41 City/Highway MPG Awards: * JD Power Vehicle Dependability Study * ALG Residual Value Awards * 2016 KBB.com Best Resale Value Awards Subcompact Car * 2016 KBB.com Brand Image Awards 2016 Kelley Blue Book Brand Image Awards are based on the Brand Watch(tm) study from Kelley Blue Book Market Intelligence. Award calculated among non-luxury shoppers. For more information, visit www.kbb.com. Kelley Blue Book is a registered trademark of Kelley Blue Book Co., Inc. Reviews: * Unmatched small car versatility thanks to unique rear seat design; high fuel economy; spacious seating and cargo area; excellent visibility. 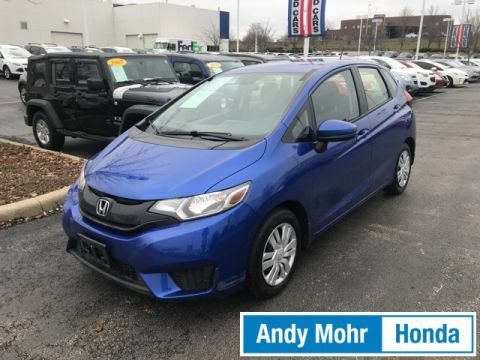 Source: Edmunds Aegean Blue Metallic 2016 Honda Fit LX FWD Get MOHR for your money at the ALL NEW Andy Mohr Honda/Hyundai in Bloomington! Call us today at 812-336-6865. 160-Watt AM/FM/CD Audio System, Electronic Stability Control, Exterior Parking Camera Rear, Outside temperature display, Remote keyless entry, Speed control, Steering wheel mounted audio controls, Telescoping steering wheel, Tilt steering wheel. CARFAX One-Owner. Clean CARFAX. Odometer is 686 miles below market average! 30/39 City/Highway MPG Awards: * 2015 IIHS Top Safety Pick * 2015 KBB.com Brand Image Awards 2016 Kelley Blue Book Brand Image Awards are based on the Brand Watch(tm) study from Kelley Blue Book Market Intelligence. Award calculated among non-luxury shoppers. For more information, visit www.kbb.com. Kelley Blue Book is a registered trademark of Kelley Blue Book Co., Inc. Reviews: * For 2015, the Honda Civic remains the act to beat, thanks to its strong reliability, safety, comfort and resale value. Whether you're looking for a practical sedan, a sporty coupe, a frugal hybrid, or an ultra-clean compressed natural gas (CNG) model, there is a Civic to meet almost any demand. Source: KBB.com * The Honda Civic is back to rest the critics of the past. Whichever Civic you choose, you'll find the technology and refinement to make the journey more exciting than the destination. A new front grille and headlights adorn the front end, while new taillights help you stand out from behind. Add to that its wheel options and you've got the sleekest Civic yet. The 1.8L i-VTEC engine uses state of the art engineering technology to produce an impressive 143hp, yet it still receives excellent fuel-efficiency ratings and a Partial Zero-Emission Vehicle rating, all on regular gasoline. The continuously variable transmission allows the engine to always operate at the most efficient rpm level, enabling maximum efficiency under all driving conditions. There is also a Hybrid available with 44cty/47 hwy MPG ratings as well as the performance minded Si with a 205hp engine. Interior features include an impressive array of available tech features including an available 7-inch display audio with a touch-screen interface; the Honda LaneWatch system which activates a tiny camera on the passenger side mirror when you signal to change lanes to cover more view than the passenger-side mirror; HondaLink's Aha app allows you to access news, social media, restaurant searches, internet radio, and more; a rearview camera is available with up to 3 available angles to view; Satellite navigation is also available with voice recognition software. The Advanced Compatibility Engineering II body design utilizes a network of connected structural elements to distribute crash energy more evenly throughout the front of the vehicle and more evenly disperse the forces transferred to other vehicles in a crash. Source: The Manufacturer Summary * Comfortable and composed ride; good fuel economy; spacious interior; wide variety of engines available; available coupe body style. 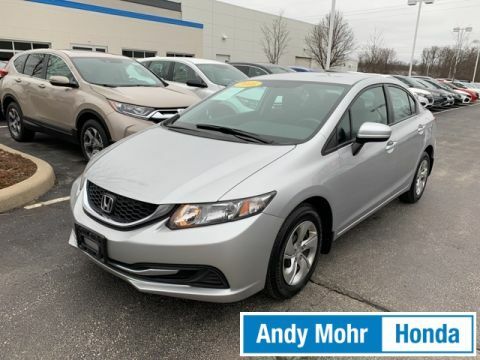 Source: Edmunds Alabaster Silver Metallic 2015 Honda Civic LX FWD Get MOHR for your money at the ALL NEW Andy Mohr Honda/Hyundai in Bloomington! Call us today at 812-336-6865. Certified. 160-Watt AM/FM/CD Audio System, Cloth Seat Trim, Delay-off headlights, Electronic Stability Control, Exterior Parking Camera Rear, Four wheel independent suspension, Front Center Armrest, Outside temperature display, Power door mirrors, Radio data system, Reclining Front Bucket Seats, Remote keyless entry, Security system, Steering wheel mounted audio controls, Telescoping steering wheel, Tilt steering wheel. CARFAX One-Owner. Clean CARFAX. Odometer is 9097 miles below market average! 30/39 City/Highway MPG Honda Certified Pre-Owned Details: * Warranty Deductible: $0 * Limited Warranty: 12 Month/12,000 Mile (whichever comes first) after new car warranty expires or from certified purchase date * Roadside Assistance with Honda Care purchase * Vehicle History * Powertrain Limited Warranty: 84 Month/100,000 Mile (whichever comes first) from original in-service date * 182 Point Inspection * Transferable Warranty Awards: * 2015 IIHS Top Safety Pick * 2015 KBB.com Brand Image Awards 2016 Kelley Blue Book Brand Image Awards are based on the Brand Watch(tm) study from Kelley Blue Book Market Intelligence. Award calculated among non-luxury shoppers. For more information, visit www.kbb.com. Kelley Blue Book is a registered trademark of Kelley Blue Book Co., Inc. Reviews: * For 2015, the Honda Civic remains the act to beat, thanks to its strong reliability, safety, comfort and resale value. Whether you're looking for a practical sedan, a sporty coupe, a frugal hybrid, or an ultra-clean compressed natural gas (CNG) model, there is a Civic to meet almost any demand. Source: KBB.com * The Honda Civic is back to rest the critics of the past. Whichever Civic you choose, you'll find the technology and refinement to make the journey more exciting than the destination. A new front grille and headlights adorn the front end, while new taillights help you stand out from behind. Add to that its wheel options and you've got the sleekest Civic yet. The 1.8L i-VTEC engine uses state of the art engineering technology to produce an impressive 143hp, yet it still receives excellent fuel-efficiency ratings and a Partial Zero-Emission Vehicle rating, all on regular gasoline. The continuously variable transmission allows the engine to always operate at the most efficient rpm level, enabling maximum efficiency under all driving conditions. There is also a Hybrid available with 44cty/47 hwy MPG ratings as well as the performance minded Si with a 205hp engine. Interior features include an impressive array of available tech features including an available 7-inch display audio with a touch-screen interface; the Honda LaneWatch system which activates a tiny camera on the passenger side mirror when you signal to change lanes to cover more view than the passenger-side mirror; HondaLink's Aha app allows you to access news, social media, restaurant searches, internet radio, and more; a rearview camera is available with up to 3 available angles to view; Satellite navigation is also available with voice recognition software. The Advanced Compatibility Engineering II body design utilizes a network of connected structural elements to distribute crash energy more evenly throughout the front of the vehicle and more evenly disperse the forces transferred to other vehicles in a crash. Source: The Manufacturer Summary * Comfortable and composed ride; good fuel economy; spacious interior; wide variety of engines available; available coupe body style. 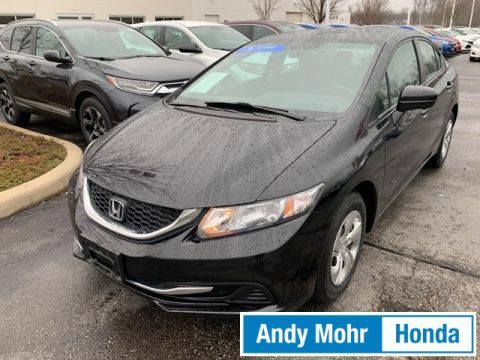 Source: Edmunds Crystal Black Pearl 2015 Honda Civic LX FWD Get MOHR for your money at the ALL NEW Andy Mohr Honda/Hyundai in Bloomington! Call us today at 812-336-6865. Certified. 160-Watt AM/FM/CD Audio System, Cloth Seat Trim, Delay-off headlights, Electronic Stability Control, Exterior Parking Camera Rear, Four wheel independent suspension, Front Center Armrest, Outside temperature display, Reclining Front Bucket Seats, Remote keyless entry, Steering wheel mounted audio controls, Telescoping steering wheel, Tilt steering wheel. CARFAX One-Owner. Clean CARFAX. ***Honda Certified Pre-Owned means you not only get the reassurance of a 12mo/12,000 mile limited warranty, but also up to a 7yr/100k mile powertrain warranty, a 182-point inspection/reconditioning, and a FREE vehicle history report. *** Odometer is 8654 miles below market average! 30/39 City/Highway MPG Honda Certified Pre-Owned Details: * Limited Warranty: 12 Month/12,000 Mile (whichever comes first) after new car warranty expires or from certified purchase date * Transferable Warranty * Warranty Deductible: $0 * Vehicle History * 182 Point Inspection * Powertrain Limited Warranty: 84 Month/100,000 Mile (whichever comes first) from original in-service date * Roadside Assistance with Honda Care purchase Awards: * 2015 IIHS Top Safety Pick * 2015 KBB.com Brand Image Awards 2016 Kelley Blue Book Brand Image Awards are based on the Brand Watch(tm) study from Kelley Blue Book Market Intelligence. Award calculated among non-luxury shoppers. For more information, visit www.kbb.com. Kelley Blue Book is a registered trademark of Kelley Blue Book Co., Inc. Reviews: * For 2015, the Honda Civic remains the act to beat, thanks to its strong reliability, safety, comfort and resale value. Whether you're looking for a practical sedan, a sporty coupe, a frugal hybrid, or an ultra-clean compressed natural gas (CNG) model, there is a Civic to meet almost any demand. Source: KBB.com * The Honda Civic is back to rest the critics of the past. Whichever Civic you choose, you'll find the technology and refinement to make the journey more exciting than the destination. A new front grille and headlights adorn the front end, while new taillights help you stand out from behind. Add to that its wheel options and you've got the sleekest Civic yet. The 1.8L i-VTEC engine uses state of the art engineering technology to produce an impressive 143hp, yet it still receives excellent fuel-efficiency ratings and a Partial Zero-Emission Vehicle rating, all on regular gasoline. The continuously variable transmission allows the engine to always operate at the most efficient rpm level, enabling maximum efficiency under all driving conditions. There is also a Hybrid available with 44cty/47 hwy MPG ratings as well as the performance minded Si with a 205hp engine. Interior features include an impressive array of available tech features including an available 7-inch display audio with a touch-screen interface; the Honda LaneWatch system which activates a tiny camera on the passenger side mirror when you signal to change lanes to cover more view than the passenger-side mirror; HondaLink's Aha app allows you to access news, social media, restaurant searches, internet radio, and more; a rearview camera is available with up to 3 available angles to view; Satellite navigation is also available with voice recognition software. The Advanced Compatibility Engineering II body design utilizes a network of connected structural elements to distribute crash energy more evenly throughout the front of the vehicle and more evenly disperse the forces transferred to other vehicles in a crash. Source: The Manufacturer Summary * Comfortable and composed ride; good fuel economy; spacious interior; wide variety of engines available; available coupe body style. 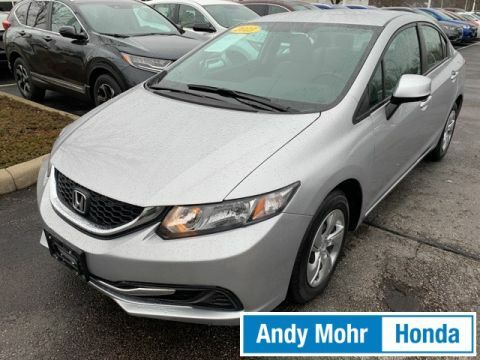 Source: Edmunds Alabaster Silver Metallic 2015 Honda Civic LX FWD Get MOHR for your money at the ALL NEW Andy Mohr Honda/Hyundai in Bloomington! Call us today at 812-336-6865. Certified. 160-Watt AM/FM/CD Audio System, Delay-off headlights, Electronic Stability Control, Exterior Parking Camera Rear, Four wheel independent suspension, Front Center Armrest, Outside temperature display, Reclining Front Bucket Seats, Remote keyless entry, Steering wheel mounted audio controls, Telescoping steering wheel, Tilt steering wheel. CARFAX One-Owner. Clean CARFAX. 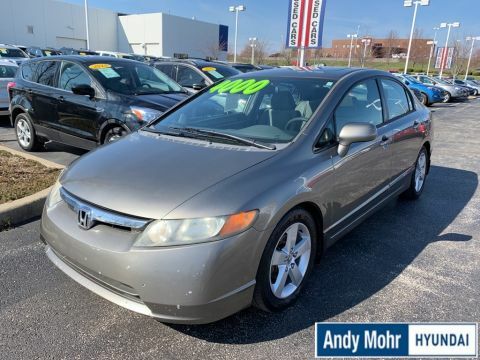 ***Honda Certified Pre-Owned means you not only get the reassurance of a 12mo/12,000 mile limited warranty, but also up to a 7yr/100k mile powertrain warranty, a 182-point inspection/reconditioning, and a FREE vehicle history report. *** 30/39 City/Highway MPG Honda Certified Pre-Owned Details: * Transferable Warranty * Vehicle History * 182 Point Inspection * Limited Warranty: 12 Month/12,000 Mile (whichever comes first) after new car warranty expires or from certified purchase date * Roadside Assistance with Honda Care purchase * Warranty Deductible: $0 * Powertrain Limited Warranty: 84 Month/100,000 Mile (whichever comes first) from original in-service date Awards: * 2015 IIHS Top Safety Pick * 2015 KBB.com Brand Image Awards 2016 Kelley Blue Book Brand Image Awards are based on the Brand Watch(tm) study from Kelley Blue Book Market Intelligence. Award calculated among non-luxury shoppers. For more information, visit www.kbb.com. Kelley Blue Book is a registered trademark of Kelley Blue Book Co., Inc. Reviews: * For 2015, the Honda Civic remains the act to beat, thanks to its strong reliability, safety, comfort and resale value. Whether you're looking for a practical sedan, a sporty coupe, a frugal hybrid, or an ultra-clean compressed natural gas (CNG) model, there is a Civic to meet almost any demand. Source: KBB.com * The Honda Civic is back to rest the critics of the past. Whichever Civic you choose, you'll find the technology and refinement to make the journey more exciting than the destination. A new front grille and headlights adorn the front end, while new taillights help you stand out from behind. Add to that its wheel options and you've got the sleekest Civic yet. The 1.8L i-VTEC engine uses state of the art engineering technology to produce an impressive 143hp, yet it still receives excellent fuel-efficiency ratings and a Partial Zero-Emission Vehicle rating, all on regular gasoline. The continuously variable transmission allows the engine to always operate at the most efficient rpm level, enabling maximum efficiency under all driving conditions. There is also a Hybrid available with 44cty/47 hwy MPG ratings as well as the performance minded Si with a 205hp engine. Interior features include an impressive array of available tech features including an available 7-inch display audio with a touch-screen interface; the Honda LaneWatch system which activates a tiny camera on the passenger side mirror when you signal to change lanes to cover more view than the passenger-side mirror; HondaLink's Aha app allows you to access news, social media, restaurant searches, internet radio, and more; a rearview camera is available with up to 3 available angles to view; Satellite navigation is also available with voice recognition software. The Advanced Compatibility Engineering II body design utilizes a network of connected structural elements to distribute crash energy more evenly throughout the front of the vehicle and more evenly disperse the forces transferred to other vehicles in a crash. Source: The Manufacturer Summary * Comfortable and composed ride; good fuel economy; spacious interior; wide variety of engines available; available coupe body style. 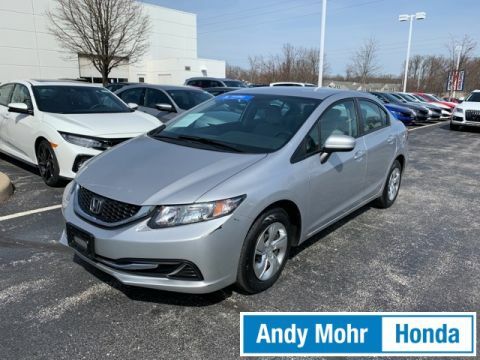 Source: Edmunds Alabaster Silver Metallic 2015 Honda Civic LX FWD Get MOHR for your money at the ALL NEW Andy Mohr Honda/Hyundai in Bloomington! Call us today at 812-336-6865. 17" 10-Spoke Alloy Wheels, AM/FM/CD Audio System w/6 Speakers, Compass, Electronic Stability Control, Front fog lights, Power moonroof, Remote keyless entry, Speed control, Steering wheel mounted audio controls, Telescoping steering wheel, Tilt steering wheel, Traction control. Clean CARFAX. 22/30 City/Highway MPG Awards: * ALG Residual Value Awards * 2014 KBB.com Brand Image Awards 2016 Kelley Blue Book Brand Image Awards are based on the Brand Watch(tm) study from Kelley Blue Book Market Intelligence. Award calculated among non-luxury shoppers. For more information, visit www.kbb.com. Kelley Blue Book is a registered trademark of Kelley Blue Book Co., Inc. Reviews: * The 2014 Honda CR-V is as comfortable mushing through unplowed streets as it is circling the flea market ready to haul home some vintage antiques. Excellent fuel economy, a very reasonable price, and a near flawless repair record should seal the deal. Source: KBB.com * Abundant passenger and cargo room; good fuel economy; user-friendly controls; ample standard tech features; strong crash test scores. Source: Edmunds * The 2014 Honda CR-V has a modern aerodynamic look, with sweeping lines, exciting body sculpting, and a dramatic profile. It has enough attitude and ability to get you around town and then tackle the open road and the great outdoors. The CR-V comes equipped with a 2.4-Liter i-VTEC 4-Cylinder engine with 185 Horsepower and a 5-Speed Automatic Transmission. It has a rigid unit-body structure, coupled with taut suspension tuning, which give it impressive handling characteristics. For ultimate 4-season security, the 2014 CR-V is available with Honda's Real Time All-Wheel Drive with Intelligent Control System that smoothes out initial acceleration and can transfer up to 100 percent of torque to the rear wheels if necessary. The CR-V is very fuel-efficient and can get up to an EPA estimated 31 MPG Highway when in two-wheel drive. Hit the green ECON button, and the vehicle makes adjustments to its systems so they can be more efficient. Then you get feedback as you drive from Eco Assist to let you know how efficient your driving is. Honda has placed bars around the speedometer, and the longer you keep them in the green, the farther you can go on a tank of gas. The 5-passenger CR-V remains modestly sized on the outside, but is extremely roomy inside, with a rear seat that accommodates adults and a proper-sized cargo area. Special attention is paid to driver comfort, with supportive front seats that flank an accommodating center console punctuated by two big cup holders. A large covered center stow bin houses USB and auxiliary inputs as well as a 12-volt power point. Finally, its large single-piece liftgate, coupled with a significantly lower lift-over height, eases loading and unloading chores. Check out the 2014 Honda CR-V Today! 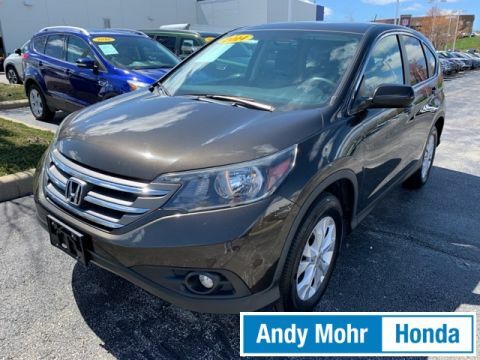 Source: The Manufacturer Summary Kona Coffee 2014 Honda CR-V EX AWD Get MOHR for your money at the ALL NEW Andy Mohr Honda/Hyundai in Bloomington! Call us today at 812-336-6865. AM/FM/CD Audio System w/4 Speakers, Electronic Stability Control, Power door mirrors, Remote keyless entry, Speed control, Steering wheel mounted audio controls, Telescoping steering wheel, Tilt steering wheel, Traction control. CARFAX One-Owner. Clean CARFAX. Odometer is 31932 miles below market average! 22/30 City/Highway MPG Awards: * JD Power Initial Quality Study * 2013 KBB.com Brand Image Awards 2016 Kelley Blue Book Brand Image Awards are based on the Brand Watch(tm) study from Kelley Blue Book Market Intelligence. Award calculated among non-luxury shoppers. For more information, visit www.kbb.com. Kelley Blue Book is a registered trademark of Kelley Blue Book Co., Inc. Reviews: * If you're looking for simple, dependable transportation in a vehicle that can handle snow and mud as efficiently as it does a day of cruising yard sales, the 2013 Honda CR-V is an excellent choice. Need more reasons? There's good fuel economy, a reasonable price and lots of standard equipment. Source: KBB.com * Lots of room for passengers and cargo; high fuel economy; user-friendly controls; ample tech and family-friendly features; top crash test scores. 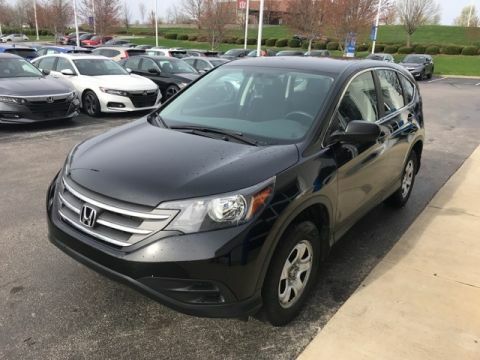 Source: Edmunds Crystal Black Pearl 2013 Honda CR-V LX AWD Get MOHR for your money at the ALL NEW Andy Mohr Honda/Hyundai in Bloomington! Call us today at 812-336-6865. Certified. Automatic temperature control, Electronic Stability Control, Exterior Parking Camera Rear, Fully automatic headlights, Outside temperature display, Radio: 160-Watt AM/FM Audio System, Remote keyless entry, Speed control, Steering wheel mounted audio controls, Telescoping steering wheel, Tilt steering wheel, Traction control. CARFAX One-Owner. 31/41 City/Highway MPG Honda Certified Pre-Owned Details: * Warranty Deductible: $0 * 182 Point Inspection * Limited Warranty: 12 Month/12,000 Mile (whichever comes first) after new car warranty expires or from certified purchase date * Vehicle History * Roadside Assistance with Honda Care purchase * Powertrain Limited Warranty: 84 Month/100,000 Mile (whichever comes first) from original in-service date * Transferable Warranty Awards: * 2016 IIHS Top Safety Pick+ (When equipped with honda sensing) * NACTOY 2016 North American Car of the Year * 2016 KBB.com Brand Image Awards 2016 Kelley Blue Book Brand Image Awards are based on the Brand Watch(tm) study from Kelley Blue Book Market Intelligence. Award calculated among non-luxury shoppers. For more information, visit www.kbb.com. 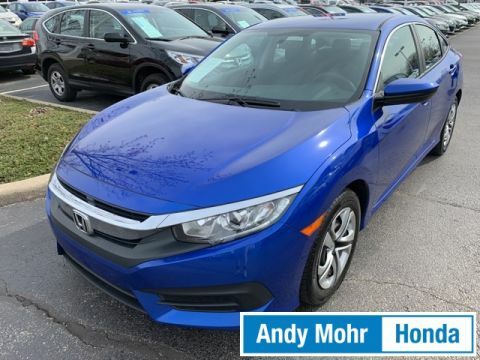 Kelley Blue Book is a registered trademark of Kelley Blue Book Co., Inc. Aegean Blue Metallic 2016 Honda Civic LX FWD Get MOHR for your money at the ALL NEW Andy Mohr Honda/Hyundai in Bloomington! Call us today at 812-336-6865. PLUS certification on qualifying vehicles. Destination, tax, title and tags not included in vehicle prices shown and must be paid by the purchaser. While great effort is made to ensure the accuracy of the information on this site, errors do occur so please verify information with a customer service representative. **With approved credit. Terms may vary. Monthly payments are only estimates derived from the vehicle price with a month term % interest and % down payment. Payment estimate does not include taxes and dealer fees.